Sakurajima is an active stratovolcano and a former island in Kyushu, Japan. Lava flows from the volcano’s 1914 eruption connected it with the Osumi Peninsula, as shown in the bottom left of this Overview. Since 1955, Sakurajima has been erupting almost constantly, producing thousands of small explosions every year. The Arc de Triomphe is located at the center of 12 radiating avenues in Paris, France. Yesterday, millions took to these streets to celebrate France’s second FIFA World Cup victory (with a 4-2 final win over Croatia). Today, players and coaches will parade up the Champs-Elysees avenue, which passes diagonally through this Overview from bottom left to upper right. We’re excited to launch a new series called “Drone Sundays” that will feature some of the best shots from our friends over at From Where I Drone. Today’s post shows tulip fields in Lisse, Netherlands, which begin to bloom in March and are in peak bloom by late April. The Dutch produce a total of 4.32 billion tulip bulbs each year. A bloat of hippopotamuses relax in a lagoon inside South Luangwa National Park in eastern Zambia. The park, which spans 3,490 square miles (9,050 sq. km), is a world-renowned wildlife haven and one of Africa’s most popular sites for walking safaris. More than 60 different animal species and 400 species of birds call South Luangwa home. Everglades National Park in Florida is the largest tropical wilderness in the United States east of the Mississippi River, covering more than 1.5 million acres. The park was established in 1934 to protect the area’s fragile ecosystem and is home to 36 threatened or protected species including the American crocodile and West Indian manatee. Peat ponds and polders form a unique landscape in the Twiske, a large recreation area and nature reserve in the northwest of the Netherlands. Polders are low-lying pieces of reclaimed land protected by dikes, and roughly 4,000 of them exist in the Netherlands. Located just north of Amsterdam, the Twiske is home to a wealth of reed and water birds, foxes, ermines, and other wildlife. Aerobic digesters agitate wastewater at a sewage treatment plant in Camas, Washington. This process is designed to reduce the volume of sewage sludge in the water, making it suitable for subsequent use. After it has been treated, the water is discharged from the plant into the Columbia River. Orlando International Airport is a major public airport located six miles (10 km) southeast of Downtown Orlando, Florida. It is the busiest airport in Florida and the eleventh-busiest in the United States, handling more than 44.5 million passengers in 2017. Its hub-and-spoke layout features a large main terminal building surrounded by four airside concourses, with a total of 129 gates. Evaporation ponds in the Great Salt Lake, Utah, are pictured in this Overview. The Great Salt Lake contributes an estimated $1.3 billion annually to Utah’s economy, including $1.1 billion from industry, which is mostly due to mineral extraction. Minerals extracted from the lake include sodium chloride, potassium sulfate, and magnesium-chloride. 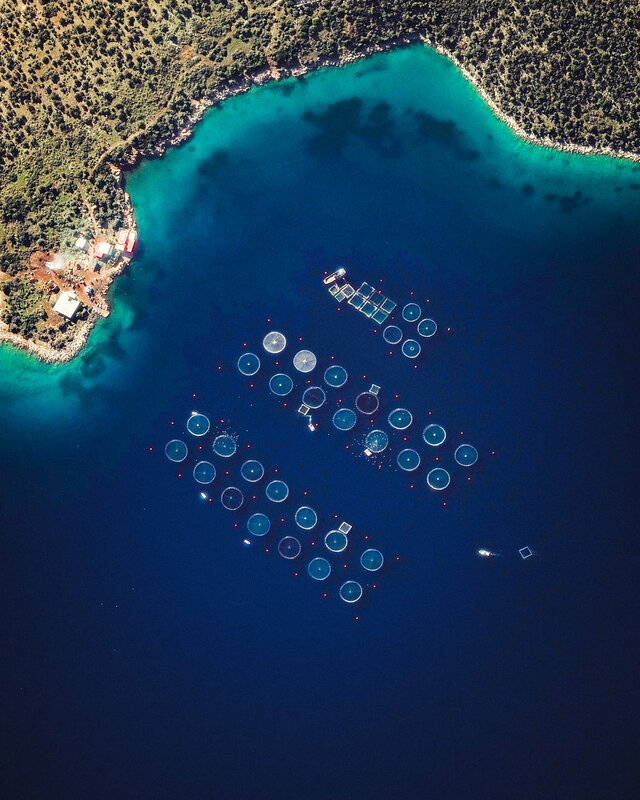 Check out this Overview, which shows a fish farming operation in the Saronic Gulf, just off the eastern tip of Greece’s Peloponnese peninsula. Fish farming — or pisciculture — involves raising fish in tanks or enclosures, usually for food. In 2015, Greece had at least 300 of these farms and raised more than 242 million pounds (109 million kg) of fish and mussels.